Dr. Kamino received her MD degree from the National Autonomous University of Mexico School of Medicine. She took her residency training in Dermatology at the Instituto de las Enfermedades Tropicales/National Autonomous University of Mexico, a fellowship in Dermatopathology at the New York University Medical Center and residency training in Anatomic Pathology at the Mount Sinai Hospital in New York and the University of California at Los Angeles Medical Center. She is Associate Professor of Dermatology and Pathology and Director of Dermatopathology at New York University School of Medicine. She has served on the Executive Committee of the International Society of Dermatopathology, and on the Board of Directors of the American Society of Dermatopathology and Editorial board of the American Journal of Dermatopathology. 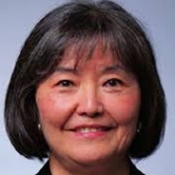 She is a past president of the American Society of Dermatopathology Dr. KaminoÃ¢â‚¬â„¢s major research interests are: Immunohistochemistry of skin tumors, histopathology of malignant melanoma and melanocytic nevi, and fibrohistiocytic proliferations.